Having lost our original flag vendor, Mike White has located/coordinated with a new vendor for a Village Vettes Corvette Club/US Flag/Caddy combination set. 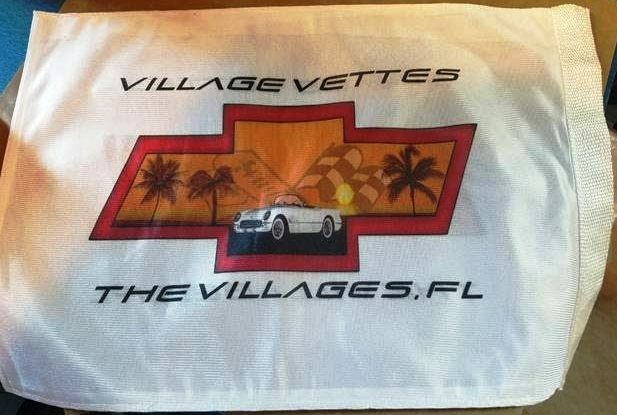 A prototype Village Vettes Corvette Club logo flag has been fabricated by vendor Barbra PECK with Artistic Dream Designs Artistic Dream Designs WebSite. The VVCC logo flag is double-sided. Barbara does NOT have the caddy sets (poles) in inventory. These are supplied by a separate vendor Doug SCHILLER (Flag Caddie Company, P.O. Box 1274, Belvidere, IL 61008 – cell (815) 979-4591 email to flagcaddie.com. To order simply go to Doug's website, FlagCaddie.com or a phone call (815-289-0489) to order the Village Vettes Corvette Club Logo/US Flag/Caddy Set. Put your patriotism on display at the next cruise-in, car show or parade with a custom designed Corvette Flag Caddie. Flag Caddie's are designed to mount flags to your Corvette's roof panel latch brackets for a seamless installation. Click the logo below and do a search using "FLAG CADDIE"
Flag Caddie package includes (1) pair of flags for the LH or RH side with specially designed poles and mounting hardware. And when Old Glory get's a little tattered - Zip carries replacement flags so that the Stars and Stripes are always looking their best. Fits 2014-2016 Corvette Convertibles. Note: The C7 Corvette Flag Caddie is not designed for high-speed events. Caddies for 2014-2016 Corvettes are designed for parades and car shows only. You'll need to provide Doug with the generation of your Corvette (C1-C7), body type (Targa, T-Top, FRC, Roadster), shipping address, etc. and he will make the associated coordination with Barbra to complete your order. There is a one payment of $56. You will pay Doug the entire cost of the flag and pole ($56.00) and he will pay Barb for the fabric flag fabrication. If you encounter a problem and/or need further clarification, contact Mike White at e-mail by clicking the button below.